Like monarchs, and mere mortals, not all are born equal, and the world of brewing is no exception. It seems that some beers are born to be average and some beers born to be good, but when you come across that rare exception of a beer that stands out so stunningly from the crowd, your senses stand to attention and take note! With an industry dominated by large scale brewers, mediocrity, sadly is the name of the game, with beers not so much designed to 'challenge' your senses but to nullify them with bland products designed for an undiscerning consumer. Thankfully, from the micro and craft brewers worldwide we are offered beers that can give us so much more, but some brewers in particular stand apart from others with their offerings - and Stone Breweries India Pale Ale is one such beer. 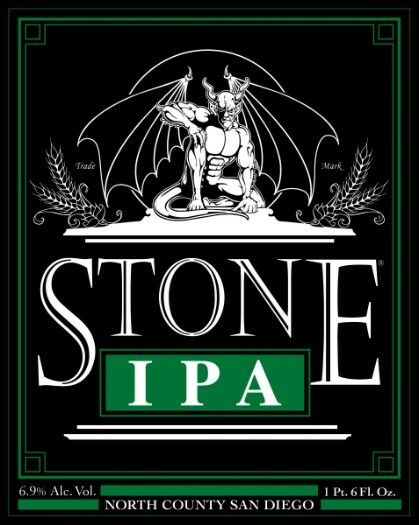 Stone have a deep love of hops, and this is evident in nearly all their beers! But what struck me when sampling their IPA recently was the correlation between hop level and strength. Is there such a thing as a hop level that is ideally suited to a given strength to bring out the best qualities of both ? Possibly so on the evidence of this Stone brew. Many brewers of classic IPA's both here and in the US know the importance hops played in the IPA tradition, as it was this element that gave the beers their stability to survive the long voyage to India. Today, all the brewers who emulate the style, are, in essence, producing their own interpretation of the theme, as no two brewers are the same, and the original brews and how they would have tasted are long lost to the mists of time. The British brewers of old were limited by the choices of hops available to them, and the variable potency they offered. The hops function was seen as one dimensional, to add 'longevity' to the beers life, but both flavour and aroma were not considered part of its remit. The 'stability' they could offer the beers was considered their prime attribute. Conversely, today, the ever more powerfully flavoured hops available need judicious use to get the balance right, overplayed or clumsily used they can begin to work against the beer to is detriment. it is the ' bittering ' element of the hops, the alpha acids, that need to be judged so carefully. To much and the flavour can become a mouth puckering assault on the palate, almost numbing the taste buds into submission and making it virtually impossible to pick up on the more subtle flavour compounds and notes! The American ' Imperial ' IPA styles use high levels of hops along with high alcohol content ( 9% alc/vol and above ) but unlike the ' Barley Wine Styles ' made in the US are not designed to age in bottle to bring out their best qualities. Originally the ' Imperial ' designation was given to the famous Russian Stouts, that did benefit from being aged. The Imperial IPA's become a heady experience, but not in the realms of comfortable drinking for many, criticised by some as being overtly hoppy and unapproachable, they are very much a speciality product. The Stone IPA on the other hand sits within the alcohol parameters of the original IPA's, and this could prove to be one of its strengths. On tasting, the Stone brew has a powerfully inviting hop aroma with pine needle and freshly mown ' cut grass ' notes, a touch of citrus lime, and warming barley sugar. The flavour is very big, but balanced by the strength, with a complex, challenging, interwoven multi layered hop flavour on the palate , which seems equally fresh and full at every sip. There is great length on the finish and on the back of the tongue as the flavours continue to linger on and on. At 6.9% alc/vol the Stone IPA seems to offer not just the best drink ability to strength ratio, but allows the flavours to meld so well. But, as with all stunning beers there is also something intangible in terms of quality that takes it to another level, and which separates it from others, and that is what makes the beer so fascinating. Great beers such as this are not born every day, and in the world of brewing at least, inequality is certainly no bad thing! Contact Real Ale .com for availability in the UK, or go to the Stone Brewery site athttp://www.stonebrew.com/ for further information.